Experience Peace in the Presence of the Savior Who Is Always with You. The #1 bestselling 365-day devotional, Jesus Calling, has impacted over 25 million lives with words of encouragement, comfort, and reassurance of His unending love. These writings are based on Jesus’ own words of hope, guidance, and peace within Scripture—penned by one who loves Him and reveres His Word. 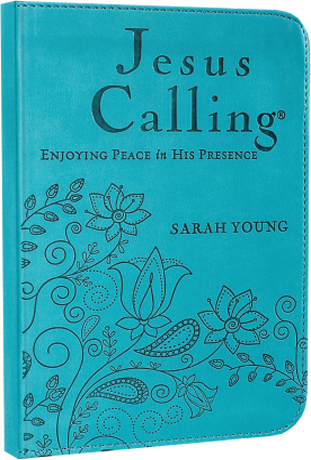 The much-loved devotions inside Jesus Calling will help you look forward to your time with the Lord. Experience a deeper relationship with Jesus as you savor the presence of the One who understands you perfectly and loves you forever. A beautifully debossed teal leathersoft cover with room for personalization makes this edition a great gift or self-purchase.